I am getting an odd error with one of my mining rigs i just set up with spare parts, I was wondering if anyone has a solution for this problem. My setup looks like C:\cgminer-3.7.2-windows\cgminer.exe --scrypt -o http://127.0.0.1:8332 -u username -p password -I 18 -g 1 -w 256 --thread-concurrency 2400 and I am running a 6670. For the life of me I cant figure why I keep getting rejected by the pool. Im having the same problem with a new rig. Any help would be appreciated. my first question is why are you using a mining proxy? that is most likely the source of your issues. cgminer supports stratum out of the box. Hello, I have the exact same probleme. I want to use a proxy so I can switch easily all my workers from pool or from coins. Do they work through a direct connection from cgminer? What proxy server are you using? 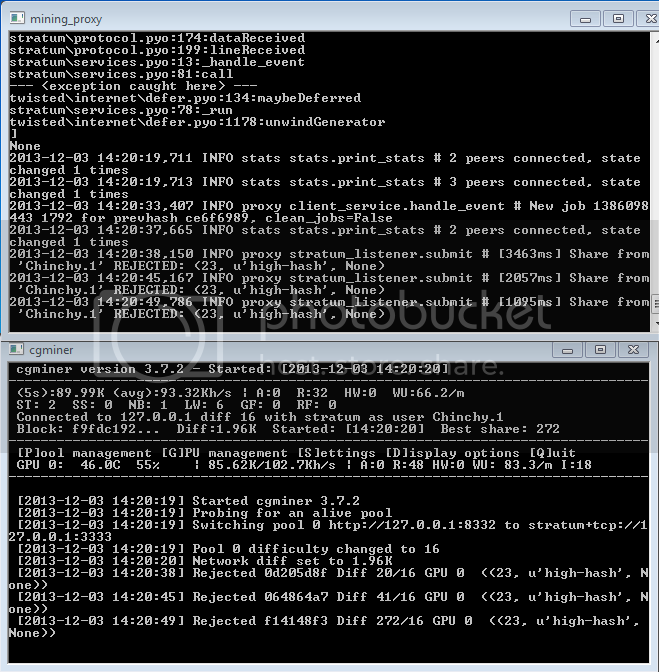 You need to determine if problem come from miner or from proxy. And you have to wait a little more than 20s after restart. You screen show reject just after switching pool.